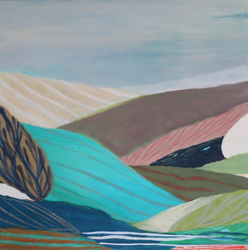 A feeling of absolute calm emanates from Belynda Henry’s exquisitely layered paintings. There is that same sense of clarity one encounters while walking on open country roads, where the air is fresh, the sky is large and the wind sweeps through your thoughts. It is in moments such as these that everything feels right and full of possibility. Henry’s images illustrate a simple, yet generative experience of nature. 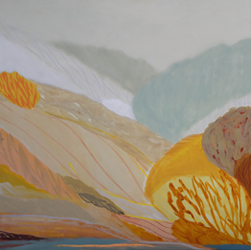 Ostensibly traditional landscape paintings, full of pleasing hues and sweeping topographies, they speak to classical notions of order, balance and harmony. But they also reveal an interest in the way light, tone and colour can be exploited to articulate a uniquely personal reception of the natural world. Her home in the hinterlands of New South Wales’ Central Coast affords the opportunity to watch and respond to the landscape on a daily basis. It is no wonder then that she has chosen to entitle her new series ‘Wanderer’ – a clear reference to her own travels – for these works operate like topographical records of her experience of both space and consciousness. For the last twenty years Henry’s creative life has been dedicated to moving through the countryside, transcribing and interpreting the textures and atmosphere of both pastoral and majestic vistas. 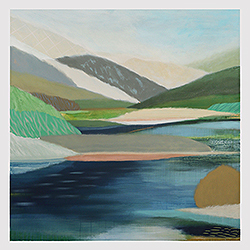 Whether depicting the familiar paddocks of her local region or confronting the brilliant icy whites and craggy darkness of Canada’s mountain districts, the beauty of Henry’s practice resides in her ability to capture a lucid vision of nature, accentuating and stylising its light and form to create something expansive, uplifting and transportive. Paddocks, hedges, clouds and rocks all form into blocks of gentle colour, held together by linear rivulets suggestive of waterways and boundaries. Filtering out all but what interests her most, the factual details of each feature is transformed into a series of loose marks and grid like patterns equivalent to, but altogether beyond formal realism. The entire landscape, from horizon to foreground, merges into one unified patchwork of spirited observation. Everything here is tender and dreamlike – an Eden, a perfumed garden or a rolling hillside from childhood. These are indeed imagined places yet they are also depictions of the physical. One can see references to the vivid colours of autumn, the glow of a sunset or the bloom of a flower informing Henry’s playful palette. Mediated by her agile observations, pools of bright colour sing and whip through the translucent layers above, charging each image with the underlying zing of nature’s proclivity. Henry’s enduring love of form and texture, of the Australian bush and the pulse of its colours, has resulted in a creative practice capable of navigating both the truth of a location and the artist’s own emotional journey through it. Undeniably stylised, her works do not aim for factual representation, but rather offer a sensual interpretation of those fleeting moments when reality and experience merge, of a world at once tangible and ethereal. Belynda has just been announced as a Finalist in this year's 2017 Paddington Art Prize. She is a four time finalist in the Wynne Prize for Landscape (2000, 2013, 2015, 2016) & a recent Archibald Prize finalist (2106). 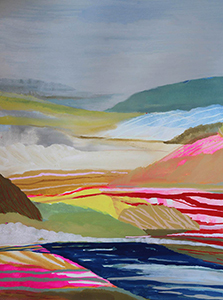 Inspired by the Australian landscape of the NSW Central Coast, Belynda Henry’s practice showcases her adventurous and passionate love of painting. 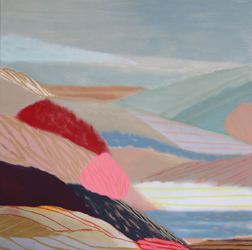 Through her vivacious use of colour Henry beautifully depicts the textured rolling hills, pristine lakes and pastel skies of her surroundings. Belynda Henry first exhibited with FLG in 2016. ‘Wanderer’ is her second successful exhibition with the gallery.